An internal federal immigration handbook’s regulations outlining how minors “aging out” of custody are supposed to be treated contrasts starkly with realities on the ground, according to immigration advocates and a federal judge’s ruling. Reveal from The Center for Investigative Reporting found the handbook in the court files of a lawsuit brought by the National Immigrant Justice Center on behalf of a group of teenagers in Washington, D.C., last month. The handbook was published in September 2017 and addresses how ICE manages, processes and deports immigrant minors. 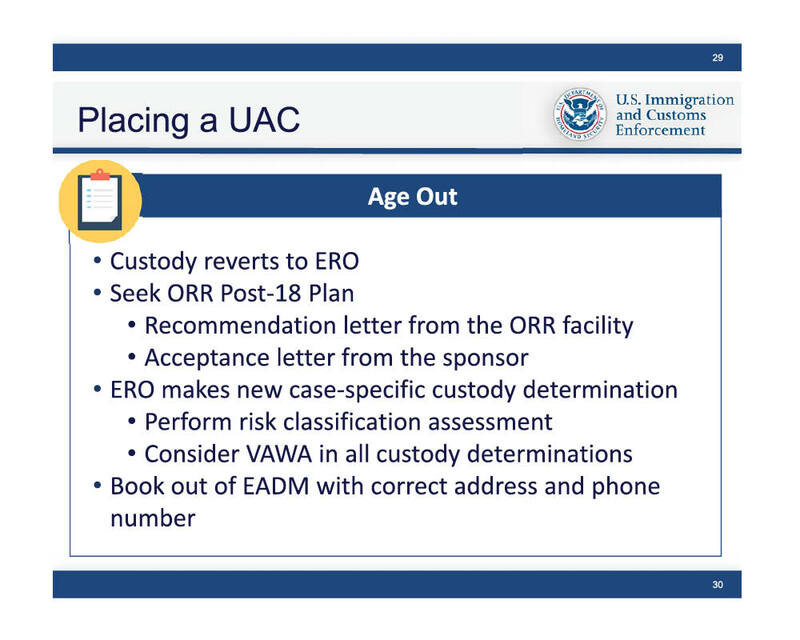 The teens accuse U.S. Immigration and Customs Enforcement of breakinga federal law requiring the agency to consider the “least restrictive setting” for unaccompanied minors who turn 18 in juvenile custody. They argue that ICE is automatically placing them in immigrant detention centers with adults instead of considering releasing them to a sponsor, a shelter or on their own recognizance. The judge’s recent ruling in that case deals solely with ICE’s failure to follow federal law on holding immigrants who turn 18. But it’s not the only place the 63-page Juvenile and Family Residential Management Unit Field Office Juvenile Coordinator Handbook conflicts with what advocates say children are experiencing. For example, it says immigration officers should use “multiple forms of evidence” when trying to determine the age of unaccompanied minors. Evidence listed includes birth certificates and other official records as well as statements by the child, his or her parents or others. Some say those examinations are not always a last resort. Kate Melloy Goettel, an attorney who represents the plaintiffs in the teenagers’ lawsuit, says that her organization hasn’t seen a good-faith effort on the part of immigration authorities to first examine birth certificates, baptismal certificates, corroborating evidence and individual statements. ICE, she said, is instead increasingly relying on physical examinations. It’s unclear how many children have been subjected to such examinations. Reveal asked ICE for statistics, but the agency hasn’t yet provided numbers. Another policy in the handbook dictates how ICE handles family units. It states that families detained by Customs and Border Patrol agents should be transferred to ICE’s Enforcement and Removal Operations unit. The handbook says nothing about separating children from parents. Yet a recent New York Times story reported that in the past six months, more than 700 immigrant children attempting to immigrate to the United States have been split from adults who claimed to be their parents. Immigrant parents told the Times they were separated by Customs and Border Patrol agents. The Border Patrol and ICE both are law enforcement agencies within the Department of Homeland Security. 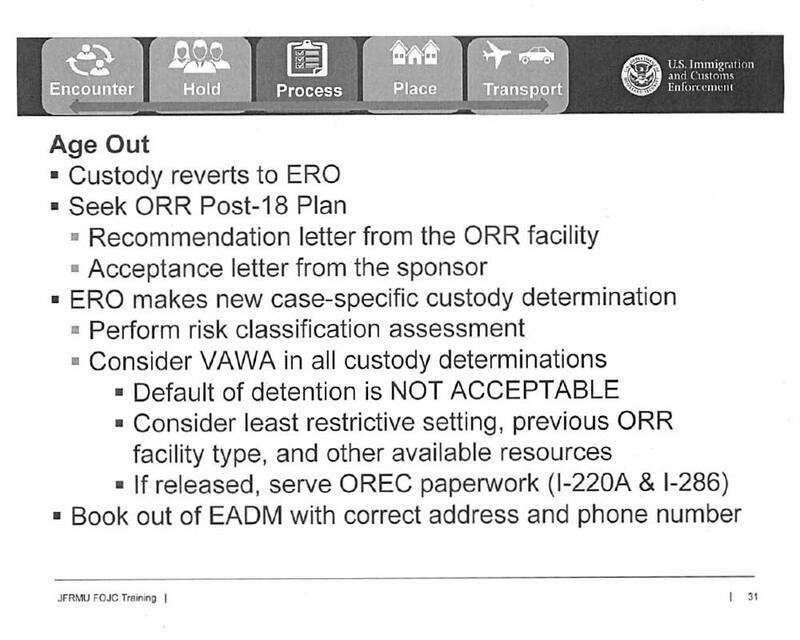 In an email, Border Patrol Deputy Assistant Public Affairs Commissioner Michael Friel told Reveal that while the agency attempts to “maintain family unity to the greatest extent operationally feasible,” families may be separated due to criminal history, evidence of abuse, suspected fraud or a lack of detention space. Contacted about the handbook last week, ICE press secretary Jennifer Elzea called it a “leaked handbook,” even though it was filed by the agency’s own attorneys in the lawsuit. On Monday, ICE spokeswoman Danielle Bennett said ICE doesn’t generally talk to the media about handbooks. “I’m not even really familiar with the handbook,” Bennett said. One of the plaintiffs in the federal suit, Wilmer Garcia Ramirez, has a family friend who was willing to sponsor him on release from a youth shelter where he was being held. The family friend even purchased a bus ticket to Pennsylvania for Garcia Ramirez. Garcia Ramirez’s removal proceeding was administratively closed by a judge while the young man waits to hear whether a claim he’s filed will allow him to obtain a green card to remain in the country. Last fall, on the morning of his 18th birthday, he was moved from a youth shelter to Eloy Detention Center in Arizona. At least 15 detainees have died since 2003 while in custody or shortly after being transferred from the Eloy facility. Despite the handbook’s instruction about holding youths in the least restrictive setting, U.S. District Judge Rudolph Contreras made clear in his opinion granting the preliminary injunction last week that ICE isn’t following federal law. During arguments before the court in Washington, D.C., last month, an attorney representing ICE had a difficult and sometimes awkward time making her argument. “Walk me through the evidence,” Contreras patiently asked U.S. Department of Justice attorney Christina Parascandola, as she attempted to show the court that ICE doesn’t automatically place all aging-out minors in adult detention. “Clearly the record shows the factors were considered,” Parascondola responded. “Show me,” Contreras said. Then he pointed out conflicting evidence the Department of Justice had submitted in its brief. That wording is missing in the agency’s 2018 presentation.